Two years ago today, hurricane Katrina barreled through New Orleans and left the city in unfavorable conditions. 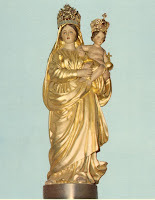 The patron Saint of Louisiana and New Orleans is Our Lady of Prompt Succor (Our Lady of Quick Help). During hurricane season many of the residents of New Orleans do novenas and daily prayers asking for the intercession of Our Lady. You can learn more here. The site has a short history as well as many prayers. I think my favorite prayer, which was exclaimed by Mother St. Michel during the fire of 1812 that destroyed a large portion of New Orelans, goes: "Our Lady of Prompt Succor, we are lost, unless you hasten to our help."